Citroen has informed the franchisees in its 182-strong dealer network that half of the sites will not continue to represent the DS Automobiles premium-sub brand from 2018. The news was officially confirmed individually to franchisees this summer, after AM revealed last November that only around half of Citroen/DS dealerships would continue with the split-off DS business. The official notice coincided with a period when the average profitability of the network has slumped from 1.2% to 0.5% after a lack of focus on retail sales. Citroen and DS Automobiles managing director Bek Hassan told AM the brand knew franchisees had concerns but he hadn’t expected Citroen to come bottom for franchise value in the latest NFDA Dealer Attitude Survey. “Clearly the NFDA results were disappointing. We’re not oblivious to the fact our dealers are saying they’re unhappy,there’s a problem, and the only thing we can do with that is react and work with them to resolve their problems,” he said. The dealers who’ll lose DS were selected due to the lack of sales opportunity for the premium brand, with criteria based on local demographics and past DS sales performances. He said Citroen franchisees have since seen the product pipeline, with increased volume expected from new C3, and other unspecified models further ahead (a C-segment crossover SUV is an obvious fit), and are more upbeat now. 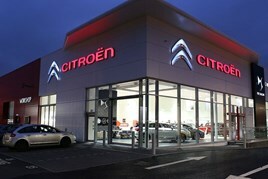 After the NFDA survey Citroen spoke with its dealer council and dealer forums. Hassan recognised the split has caused “hesitancy and concern over the future”, and he and Citroen global chief executive Linda Jackson have tried to reassure the UK network. For more about the Citroen and DS plan, read AM magazine in December. A stupid direction for this undesired brand to pursue. In time they will come to realise that this deluded strategy is counter productive to their shareholder objectives. They should stick to supporting the 'good ol Ma and Pa' dealers who are unable to represent a more successful manufacturer. I'm sorry Mr Hassan feels that's the cause. The split has nothing to do with the net work feeling down trodden. The real issue is poor sales campaign s , over targeting and to many targets. 6 in quarter 1 to achieve bonus. The network warned this would be the out come. Yet again it's the networks issue because of separation. No!